Become comfortable and familiar with the entire Excel dashboard, tabs and ribbons. 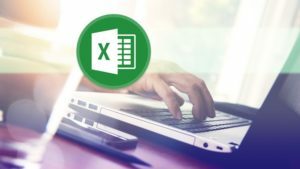 Learn all of the basics of opening an Excel document, creating a spreadsheet and saving your document to your computer. Create a spreadsheet from scratch in Excel. Use the most commonly used Excel functions to make powerful calculations. Create your own Excel charts, graphs and tables. Learn to use several of the new Excel 2016 features such as 1-click forecasting, 3D maps and the Tell Me What You Want to Do feature. Create pivot tables and charts for lightening fast sorting and organizing. Tons of helpful tips, tricks and shortcuts along the way to help you master the fundamentals of Excel 2016. All you need is a copy of Excel on your computer. The course teaches you how to use Excel starting at the very beginning. A study reported in the Wall Street Journal found that 78% of middle-skill jobs require digital skills like Excel and Word. And jobs that require digital skills also pay 13% more than those that don’t. Are you ready to land your next job and increase your pay by 13%? This course is designed to teach you the basics and beyond of Excel 2016. It’s perfect for you if you are a beginner or intermediate Excel user who needs to drastically increase your Excel skills to impress your boss, get a raise or even land a new job. Everything in the course is taught step-by-step in an easy, stress-free way. Note: This course is specifically designed for learning on a PC. If you are learning on a Mac, the shortcut keystrokes may be different on your machine. Create a basic Kitchen Remodel Costs worksheet. Learn to use the 7 most popular functions in Excel, including IF functions and VLOOKUP. Create professional looking pie charts, bar charts, column charts and more. Create a table and a range and sort your data. Create pivot charts and tables to do lightening fast analysis of your data. Learn to use new features of Excel 2016 including 1-click forecasting and 3D maps. Take your Excel skills to a whole new level to impress your boss and (although it’s ultimately up to you) position yourself for the raise or promotion you deserve. So if you’re ready to take your Excel skills to the next level and want to learn in an easy-to-follow way, click the TAKE THIS COURSE button or check out one of the free preview lectures to see if it’s the perfect fit for you. This course would also be helpful for an intermediate Excel user who needs to improve their skills in areas such as using functions; creating charts, graphs and tables; creating pivot tables and charts; formatting spreadsheets; navigating efficiently within an Excel worksheet and more. This course is helpful for increasing personal productivity, efficiency at work or even develeping skills to obtain a better job. This course would not be useful for an Excel user who has already reached the advanced or expert stage.